Swansea City’s Wilfried Bony is ignoring speculation he may leave the club in January and has pledged to help them return to the Premier League. Bony also revealed that during his 10 month absence recovering from rupturing knee ligaments his father died. “I lost my father. It was difficult, but I kept working hard and the boys, the club, everybody around me – family – helped me to come back,” he said. Bony’s third appearance of 2018-19 was in the 2-1 defeat by West Brom. The 29-year-old, who was injured in February, came off the bench as he attempts to regain full fitness following a lay-off that included a hamstring strain setback. In is absence Swansea dropped from the Premier League into the Championship as Bony wrestled with the family bereavement and his fitness fight. “I say if something doesn’t kill you, it makes you strong and then I consider I’m really strong and I will walk and think about him (his father) sometimes and not only because he helped me a lot. Having spent five years in the top flight before the Swans’ relegation last season, speculation over Bony’s future has coincided with them struggling to stay in contention for promotion. They have lost three of their past four league games and sit 11th in the table. “I have a contract so my priority here is to work hard and help the team back to the Premier League,” said Bony. “Now what’s going to be after, I’m not the boss. Bony said of his battle to regain fitness: “It’s been very frustrating and I can say it’s been very hard times; 10 months, hard times with injury. “I’m blessed because I know where I’m from and if God allows me to play again, I say ‘thank you’. “I take time. It’s not injury for one month, it’s 10 months, almost one year. 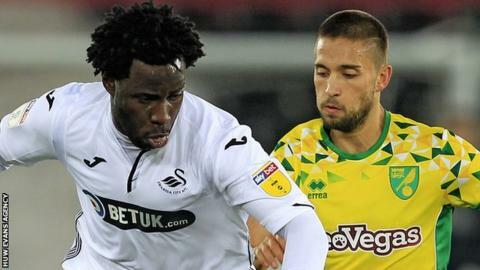 Bony has returned to a team in which young players have become a strong feature and he has backed manager Graham Potter’s approach. “There’s a lot of young players, but everybody starts like this. It will come,” said Bony. “There will be some games where they will know how to control, how to manage. “But it’s football – they deserve to be in the team and then you see how hard they work and you can see Dan James and Matt Grimes and Joe Rodon and the work they’ve done.